Wireless Sensor Networks (WSN) are nowadays applied to a wide set of domains (e.g., security, health). WSN are networks of spatially distributed, radio-communicating, battery-powered, autonomous sensor nodes. WSN are characterized by scarcity of resources, hence an application running on them should carefully manage its resources. The most critical resource in WSN is the nodes’ battery. In this paper, we propose model-based engineering facilities to analyze the energy consumption and to develop energy-aware applications for WSN that are based on Agilla Middleware. For this aim i) we extend the Agilla Instruction Set with the new battery instruction able to retrieve the battery Voltage of a WSN node at run-time; ii) we measure the energy that the execution of each Agilla instruction consumes on a target platform; and iii) we extend the Agilla Modeling Framework with a new analysis that, leveraging the conducted energy consumption measurements, predicts the energy required by the Agilla agents running on the WSN. 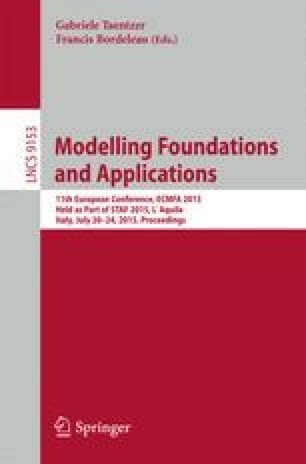 Such analysis, implemented in fUML, is based on simulation and it guides the design of WSN applications that guarantee low energy consumption. The approach is showed on the Reader agent used in the WildFire Tracker Application. This work is supported by the EU-funded VISION ERC project (ERC-240555), the Christian Doppler Forschungsgesellschaft and the BMWFJ, Austria.